The bestselling author of Zen Golf (more than 100,000 copies sold) presents a new book of profound wisdom and proven techniques for achieving the confidence in putting that all golfers know is the key to peak performance on the greens. Blending Buddhist wisdom, modern psychology, and practical golf instruction, Dr. Joe Parent's 2002 book Zen Golf broke out to become the top instructional book in golf, and continues to be a steady bestseller. Now, in the eagerly awaited follow-up, Dr. Parent provides readers with a new approach to the aspect of golf in which mental skills have the most impact: putting. Zen Putting takes a thinking-outside-the-box approach based on the idea that by tuning into the process of putting rather than worrying about the result, golfers can get out of their own way and maximize performance. Key principles include using mindful awareness to recognize and clear away distractions and negativity, and that confidence increases when golfers take the attitude that there is something fundamentally, essentially right with them rather than focusing on what's broken or flawed. 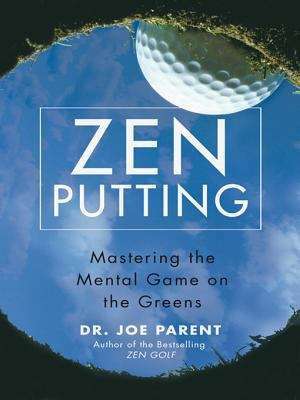 In succinct, informative chapters, Dr. Parent applies this Zen ideal to a variety of subjects for any putting situation. Chapters include: * "Unconquerable Confidence": brimming with strategies to cultivate confidence and turn frustration into enjoyment. * "Get Out of Your Own Way": exploring the obstacles we create for ourselves in putting, and how to recognize and overcome them to get the most out of our abilities. * "How to Make Every Putt": on reading greens; visualization; putting routine; the key components of a putt--path, pace, and roll; and taking the ideal attitude before putting. Unlike rigid how-to books on putting or fad coaching techniques, Zen Putting stirs each reader to cultivate their own unique style for synchronizing body and mind to achieve peak performance.